LeAnn Thieman is a nationally acclaimed professional speaker, author, and nurse who was “accidentally” caught up in the Vietnam Orphan Airlift in 1975. Her book, This Must Be My Brother, details her daring adventure of helping to rescue 300 babies as Saigon was falling to the communists. An ordinary person, she struggled through extraordinary circumstances and found the courage to succeed. Janelle Ali-Dinar, PhD is VP of Strategic Partnerships. With 15+ years of senior healthcare executive experience as a CEO, COO, VP and Regional roles in strategy, operations, leadership growth/development, and nurse/physician recruitment and retention, her experience and passion have spanned the globe. A respected and sought-after speaker on Capitol Hill and at healthcare conferences, Janelle is a champion for rural health, veterans, tribal nations, and minority populations, and serves on several federal boards. She holds a masters and doctorate in communications and is a recent graduate in public health leadership. FUN FACT: When she and her husband were dating, they tried out their acting and choreography chops and placed first in a debut of Hollywood actors with scenes from The Phantom of the Opera. Jeanne Deering is the Director of Program Implementation and Success. She’s delighted to be a part of the team and is focused on program delivery and execution; knowing all who absorb it can achieve well balanced professional and personal goals. Jeanne’s mission is to enhance your staff’s experience, thereby increasing your return on investment. Jeanne previously worked as LeAnn’s print rep coordinating prints of the SelfCare for HealthCare Study Guides and other books by LeAnn. Jeanne’s career has taken her far and wide! She has worked closely with her governor and state legislators as a lobbyist for the telecom industry in Des Moines, Iowa where she was recognized as one of the top 40 professionals under 40 years old. She is a graduate of the Greater Des Moines Leadership Institute with emphasis on Issue and Opportunity Awareness, Leadership Development, and Practice through Service. She also sold Ford Motor Company cars and trucks in Italy through the Armed Forces Exchange Services. She is committed to client relationships and service excellence. Let’s get started! Jeanne has a Bachelor’s degree in Political Science, Business, and Public Relations. She looks forward to cheering you on toward success! FUN FACT: Cheering comes naturally for Jeanne. She was co-captain of her college pom squad. Katie Hanna, Director of Marketing Client Services, has worked with LeAnn Thieman as a marketing and sales guru for over seven years. Many of Katie’s friends and family chose careers in healthcare, so even before working with LeAnn, she knew how nurses often feel burnout and need help…. badly. Katie takes joy in knowing that SelfCare for HealthCare drastically improves healthcare workers and systems, physically and fiscally. Katie holds a Bachelor’s Degree in Public Relations and lives in Denver with her husband, two awesome kids, and two hilarious French bulldogs. She loves to play tennis and soak up the beautiful Colorado environment with her family. FUN FACT: Katie’s first job was with a motorsports company, which allowed her to travel the world and hang out with some pretty cool people…like Paul Newman. 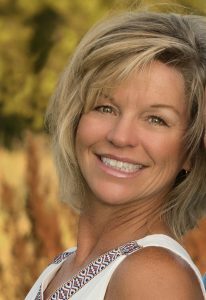 Amy Williams is SelfCare for HealthCare’s Administrative Assistant and began working with LeAnn in 1999 as her sales and marketing coordinator. With a background in healthcare PR and marketing, Amy helped launch LeAnn’s speaking career. Born and raised in Wisconsin, Amy worked for several healthcare clinics and a large metropolitan Catholic hospital handling special events, community outreach, and PR. When she’s not managing the administration and logistics for LeAnn, Amy is operating her grass-fed beef business with her husband on their mountain ranch. An avid equestrian, Amy enjoys riding, hiking, and serving as a volunteer backcountry ranger. FUN FACT: At 14 years old Amy and her feisty 24-year-old pony, Pippi Longstockings, won an international championship in the Pinto Horse Association.